Restless Souls Haunted House Complex in Huntington Station, Suffolk County, Long Island, New York. 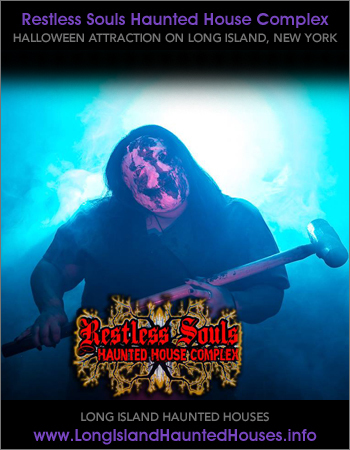 Restless Souls Haunted House Complex is the Brainchild of four Haunters and Haunt Industry Enthusiasts. Offering Three Horrifying Haunted Attractions, along with Nightly Entertainment and a Phantom Plaza Midway, you get so much value for your ticket price, it's scary. New fear is coming to Long Island in October 2016. 3 terrifying haunted attractions for one scary low price. Lose your mind as Dr. Bane thrusts you into an experiment gone wrong. KlownOSpec Glasses intensify the experience in this sensory-overloaded, sci-fi psychological funhouse. Our Phantom Plaza will also be open for your enjoyment. Nightly musical entertainment, concessions, souvenirs, photo ops and more.